The world today is characterized by great cultural diversity. More and more human communication takes place between people of different cultural and linguistic systems. This happens not only because of the far-reaching internationalization of business, science, education, but also due to emigration and the unstable political situation in some countries. The twenty-first century requires the manager to not only develop leadership skills, but also understand and accept different cultural values. The global manager should possess high competence related to work in a multicultural environment, as well as track changes and trends occurring in the global arena. The twenty-first century manager often chooses to enter foreign markets as it does not anymore require a large investment as it was before. Each conference is accompanied by the possibility of publishing an article in Polish in "Przedsiębiorczość i Zarządzanie. Studia z zarządzania międzykulturowego" or in English "Journal of Intercultural Management." 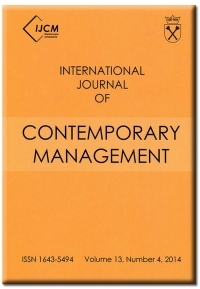 The mission of the publications is not only promoting research in the discipline of intercultural management, but also education and training in this field. We hope that they will encourage more researchers to publish their work and assist in the efficient exchange of contacts and experience. All articles published in the journal are reviewed.